There is always someone standing in the dark, staring! I ended up working late in the office yesterday. Actually, it was planned. With a consensus between me and my project lead, it was decided that I would pump in some extra hours in order to complete a pending job. Yeah, work I did. But I didn’t foresee that I would be all alone. 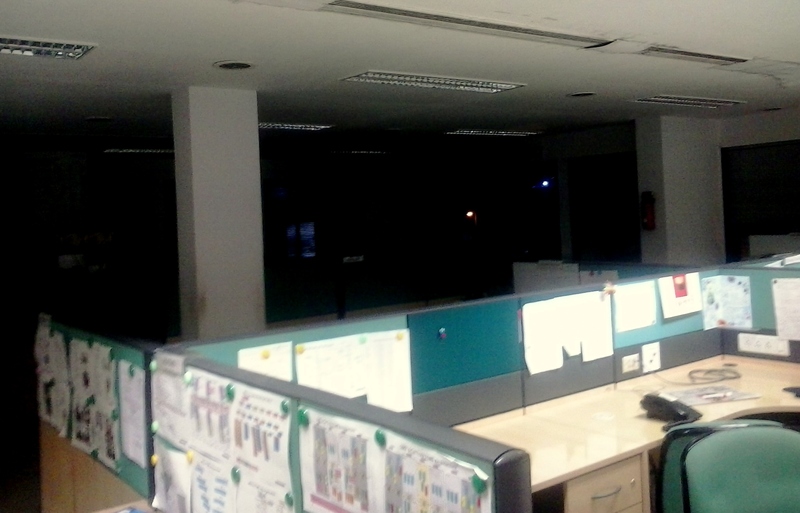 It was the first time I was all by myself in the office and that too after the sunset. I worked till 8 PM, additional 2 hours, from my usual time of leaving. The peon had switched off the lights, those not required, and so the rest of the cubicles went pitch dark. I hardly cared as I was busy with my work. I had constantly been glaring at the screen, which was unrelenting too. My orbs would hurt. I was feeling the way I used to, when I would sometimes succumb to insomnia. I badly needed a shuteye. I would occasionally get up from my seat, and peek from the window, down at the traffic. The hustle and bustle below kept me company the whole time. Whenever I would come back to my seat and engage myself in useful work, I would hear the ticking of the clock, occasional honks of the cars below, din of a drilling machine coming from the building next to ours and sometimes loud shrill of something, which my mind would always confuse with heavy breathing. It was spooky. I know it is hard to work in such an environment. It was eerie. Yet there was nothing that really bothered me as such. I guess, time has made me brave, unconcerned and intelligent. Yet in the back of my mind, all those scenes from the flick ‘The Grudge‘ kept visiting my head. Yeah, remember that office bit? I would occasionally turn around to check the plant which stood in the dark, that had a bizarre resemblance to a human being, when looked from a particular angle. I would tilt my chair occasionally to have a good look at the door in order to eschew any out of the blue surprises. Even if someone tried to play a prank at such an hour, it was still not good for the heart, so I thought. Amongst all that non-existent commotion, I worked my way through, without getting consciously alarmed of anything mentioned above, and groped for the switch in the dark to turn off the remaining lights. I am glad now sense has slipped in. I ‘now’ desire for miracles. I want them to happen. So that I behold the unusual. I don’t understand if fear is good or bad. The only thing I get is that, it is there. It has always been there. It is real. Just in different forms, in all of those eras we lived. We have simply named them. Human minds are built this way. We can’t help being apprehensive. We can’t help being afraid of the extraordinary. We would always be afraid. Sometimes for a reason, sometimes without one. It is one of the harsh truths of life, which I surmise, keeps us in check, all the time.